Morocco's dazzling mosaic of African, Arab and Berber cultures - with a dash of European influence - is at once strange and romantic, alluring and discomfiting. It's little wonder that Morocco has regularly drawn seekers of the exotic. Morocco’s dazzling mosaic of African, Arab and Berber cultures – with a dash of European influence – is at once strange and romantic, alluring and discomfiting. It’s little wonder that Morocco has regularly drawn seekers of the exotic. 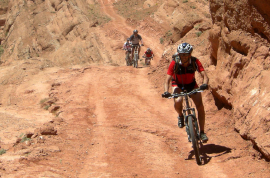 The country is one of Africa’s most popular travel destinations including adventurous mountain biking Morocco. No matter how well-seasoned a traveller you are, you’ll find plenty to see and do: fine Atlantic and Mediterranean beaches, desert excursions, wondrous imperial cities, Islamic landmarks, wild Joujoukan trance music, Roman antiquities, resort facilities, mountain villages and towering sand dunes. Just be aware that the combination of heat, dust, spicy flavours and intrusive touts can be overwhelming at times.